The sun is shining, the birds are chirping…but wait, we still have snow on the ground. Believe it or not, the weather will be warming soon which means you’ll need to make the transition from running your heater to turning on the fan or even you air conditioner. Air Tech, your trusted Ocean County HVAC company, stays on top of the changing weather conditions in our region to give you the inside scoop. It is true that this winter has been less than normal. One day we’re cranking up the heater and the next, we’re digging out our flip flops and heading to the beach. Now that Spring is upon us, it will be a matter of time before we turn off the heat and transition fully to AC. Call in the Professional Ocean County HVAC Company Pros for a Pre-Season Tune-UP. HVAC experts have the knowledge, experience and proper tools to check your unit and ensure it’s running at optimal performance. Preventive maintenance can be the best insurance against HVAC system problems throughout the summer cooling season. Plus, it will help keep your utility bills under control. Install a smart thermostat. Designed to work in harmony with your HVAC, a smart thermostat can help Ocean County homeowners establish the right kind of comfort levels for the whole family and even control those settings remotely. If you don’t need to run the air conditioner at first, don’t. Open the windows to create a cross-ventilation and flow of fresh air running through your home. Improving ventilation benefits both your family and your home. Switching frequently between heating and cooling can increase the workload on your HVAC system as well. Keep the curtains closed. The days are getting longer as the weather is warming up. That means the sun will shine brighter (and hotter) through your windows all day long. Keeping your curtains closed can help reduce the amount of radiant heat entering your home when it comes time to run the air conditioner. Spring clean the shrubs around your air conditioning unit. Clear away brushes and debris to ensure the HVAC unit has plenty of clearance to work properly. We advise approximately 12-18 inches of space. This will allow for a cleaner air intake and better overall performance. Ensure your doors and windows are sealed and caulked properly. If you didn’t do this critical step for winter, now is the time to make this home improvement. Sealing leaks will help to prevent hot air from entering when it comes time to run your AC. Replace your air filter regularly to ensure your HVAC remains clean and improves the air you and your family breathe every day. As your trusted Ocean County HVAC company, Air Technical Services Heating and Cooling experts go beyond the basics. Whether you need HVAC repairs, maintenance, replacements, installation services, we’ve got you covered. 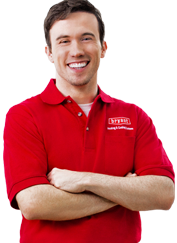 Speak with one of our HVAC experts today by calling us at 609-698-3400.